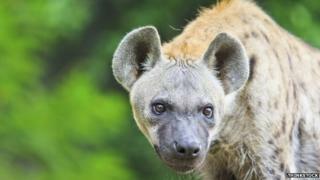 Urban hyenas are becoming a dangerous problem in the Ethiopian capital, where they attack rough sleepers. It is late evening in Addis Ababa. Stephen Brend, a zoologist with the Born Free Foundation, is driving me to the airport to catch a flight back to London. "Have you got time for a ten-minute detour?" he asks, as we passed the British embassy. "Of course," I reply. So he turns off the road and up a dirt track between some rough shacks and a collection of battered old jalopies that passes for a taxi rank in Ethiopia's capital. "There! Look there!" Stephen exclaims. In the beams of his headlights I see several pairs of eyes glinting in the darkness like tiny mirrors. As we drive closer I begin to make out the shapes of the animals behind those eyes. They are hideous beasts, as large as the largest dogs, with coarse spotted brown fur, elongated necks and front legs much longer than their back ones so their backs taper away from their powerful shoulders. "Hyenas," says Stephen. Some of the fiercest predators on earth. And they are brazenly scavenging around a collection of rubbish skips right next to a football pitch and less than 50 yds from people's homes. As we watch, a group of teenagers walks up the track, right past the animals. "They're mad," Stephen remarks. Hyenas have jaws as powerful as those of great white sharks, he explains. They can crush an elephant's leg. They devour every last morsel of their prey - bones included. "I mean - there's nothing left," he says. London is infested by urban foxes. Delhi is besieged by urban monkeys. Addis Ababa is plagued by urban hyenas that have moved in to the city from the surrounding hills and taken up residence in the capital. In some ways they perform a useful service, keeping the city's growing population of stray dogs and feral cats under control and consuming the carcasses of dead horses and other animals. But there are now reckoned to be somewhere between 300 and 1,000 of them living in the city and they are dangerous. In 2011 the airport authorities had to call in hunters to shoot a pack of hyenas that was posing a threat to planes landing and taking off. People living near the Ketchene public cemetery have complained of hyenas digging up and eating the corpses of the poor that are buried in very shallow graves. The hyenas tend to hunt in groups, and one night a guard at the British embassy saw a line of 40 running along the back fence of the compound. Periodically they attack some of the many Ethiopians who sleep rough on the streets of Addis every night. A volunteer at a clinic run by a Mother Teresa mission in the city said that a couple of times a month he has to treat homeless and destitute people who have had fingers and toes gnawed by hyenas while they were drugged or drunk. On one occasion a man was brought in after a hyena had ripped much of his scalp away while he was sleeping, leaving it hanging down over his eyes. Last year a mother camping outside St Stephanos church near the Hilton Hotel had her baby son snatched from her arms and killed by a hyena. Somalia has one of the highest rates of mental illness in the world and with a healthcare system devastated by years of war, most sufferers receive no medical help. Many are chained up - to trees or at home. Some are even locked in cages with hyenas, writes Richard Hooper. In December the authorities organised a cull, and licensed hunters killed 10 hyenas that were living on an overgrown four-hectare site near the heart of the capital which they reached along the bed of the Kebena river. At least half-a-dozen other dens have been reported close to the city centre. The authorities had to act again when a female hyena built a den in a drainpipe in a densely populated neighbourhood called Shiro Meada right behind the US embassy. She gave birth to two cubs there. She was eventually shot in January, and Stephen took the month-old cubs home. They are now living on the bed in his spare room. They are called Screamer and Stylo, and they are ugly-looking creatures. They destroy the mattress, the curtains, the cupboards - everything. "They have no sense that they're not still in a drainpipe," Stephen complains. They emit piercing high-pitched screams. They have to be fed fat-enriched milk three times a day with a bottle, the last time at midnight. For all that, says Stephen, "they're quite cute in their own little way". But when they reach six months he'll have to transfer them to Born Free's animal sanctuary on the edge of Addis. "They'll simply become too dangerous," he says. "A little nip for them is amputation for us."